A one day workshop held in Mt. 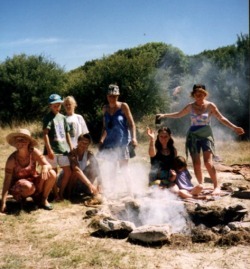 Martha beside Sunshine Reserve with views of the bay to make your own 15 inch shamanic hoop drum. All materials are supplied as well as smudging, meditation and blessing of the deer for providing the skin, animal totem for your drum’s personal medicine. You are assured of a beautiful experience as you create your very own medicine tool. I feel it a privilege and an honour to assist you in giving birth to your personal drum. Although I provide feathers, furs, beads etc; I encourage you to bring something of your own to attach to the drum stick - feathers, crystals, shells - any special item which is an expression of your medicine. Bookings are essential, so contact me now to find out when the next workshop will be held. Jan - "Hi Judy, Thank you so much for creating such a healing space to create my Native American drum. 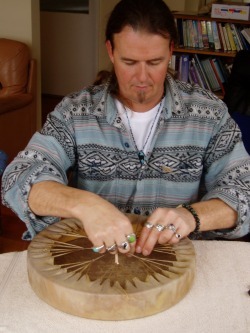 Your connection to Mother Earth and Source ensured that the drum making process was undertaken in a sensitive and respectful way, and I was transported to another dimension during the day. The memory of this day is one that I will treasure always, and my drum is so unique and beautiful, that I feel that it is an extension of my heart. It is just beautiful and we had a Pipe Ceremony last night to honour the deer that gave it's life to live on in our drums. Thank you again for facilitating such a special and memorable experience. Infinite love and gratitude." Angela - I feel everyone needs a drum. The one I made with you Judy so many years ago still beats like the day I gave birth to it. Frankie - the drum making workshop was a wonderful experience. I still have mine - it sounds as good as new , I can't recommend the day highly enough. This workshop is designed to help you get an understanding of the importance of different types of sound used in healing. We work in pairs so that you can give and in turn, receive. 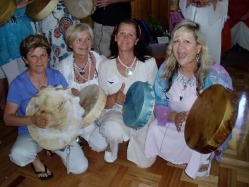 Learn to use various instruments such as Shamanic Medicine Drums, Chakra Energy Chimes, Harmonic Whirlies, Rattles, Aboriginal Clap Sticks, Voice, Tibetan Bells and bowls to bring your body back into balance. We will align the chakras and work with the elements Earth, Fire, Water and Air and Ether/Spirit. Workbook included in the course. This is a half day workshop held in Mt. Martha on the Mornington Peninsula, or gather a group of 6 and I can possibly come to you. 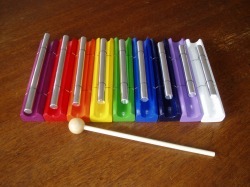 I've been meaning to email you back after the other days sound workshop too. WOW! I can tell you that that workshop really touched me. I feel amazing and more connected to the earth, feelings that I had when I was a kid (being grounded etc) have come back to me and although subtly (though I am sensitive to energy) I feel different and certainly more pizzazz going on here! So I wanted to thank you for the day. Thank you for facilitating such a lovely, relaxed and inspiring workshop today. Join us at different locations across the Mornington Peninsula when we gather for Global Healing Ceremonies and link ups such as Equinoxes, Solstices, 11.11, 12.12, Mayan Day Out of Time, World Angel Day, Whale Gatherings and World Environment Day etc. Also the seasonal aboriginal guided "Listening to the Land" walks. Send me an email from the Contact Page with 'Global Link-ups' in the Subject and you will be added to the mailing list to be informed of upcoming events. 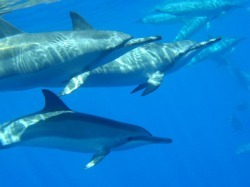 Swim within metres of the Dolphins and Seals as they play in their natural environment. 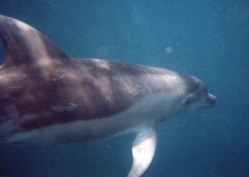 Join me on weekdays during the summer season (December-April) on discount priced snorkelling with Dolphins and Seals. Supervised by qualified snorkelling instructors following dolphin swimming guidelines, these encounters are conducted without causing interference to social structures or natural lifestyles. You are supplied with wetsuits, mask, snorkel and qualified crew to explain usage of equipment and the educational interaction. Explore Port Phillip Bay aboard the vessel Polperro and discover Australian Fur Seals, Bottle Nose Dolphins, abundant marine creatures, bird life and historical forts, Popes Eye, South Channel Fort and Point Nepean. 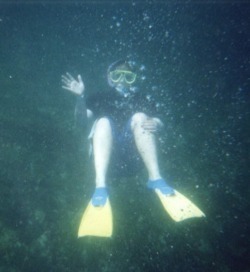 A fun adventure suitable for beginner to advanced snorkellers. For further details, please send me an email via the Contact Page.